Yesterday tartan, today checked, I believe I’ve gone print crazy, but I love the concept of prints so no need to call any special institutions… Today I’ve injected a substantial amount of Toshop into my outfit and even if you don’t believe me, I’ll tell you it was totally by accident. Putting outfits together are tricky when it comes to branding, nobody wants to look like they walked straight out of a catalogue for one fashion brand, well, nobody should! We should all want variety in our lives. A bit of H&M contrasting with some Zara, maybe rounded off with a little Chanel, it doesn’t always have to be that your outfit is made up of pieces from one particular store. Regardless, this is the dilemma I faced, saying one thing and my outfit contradicting me completely, but as I said, in my defence, it was a genuine accident and I did manage to break up the Topshop frenzy with some shoes from Primark so all was well in the end. My black and white patterned cropped trousers were a personal favorite of my mums and belonged to her, but she claims they don’t look right on her anymore, soooo, they are now mine! Really couldn’t tell you how much they were as they were bought a long, long time ago, but they are real beaut’s so I’m guessing, knowing Topshop, they’ll be a little pricier than your average cropped trouser. 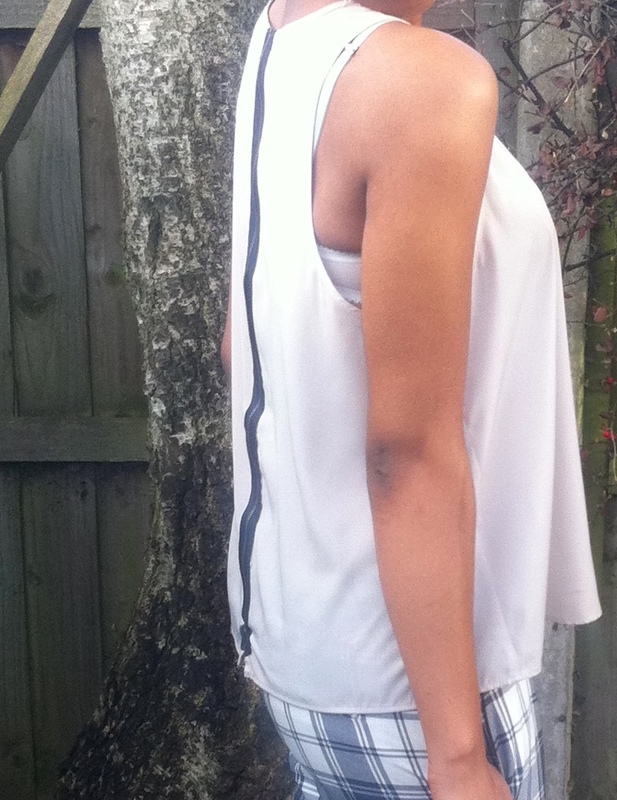 Moving on, my silk cream zip-back top is from Topshop also, was £28 and is a personal favorite of mine. As for my beige suede heels, I think they are really perfect for spring. They are a great easy-to-walk-in heel and made my much-loved blue polish look exceptionally bright, which is always a plus. They were an impulse buy in Primark a while back, probably the end of last summer come to think of it which explains why they were put away pretty much as soon as they were purchased, I truly have only worn them out of the house once to see a film I think and that’s really all the attention they’ve received until now! They were £13 and quite cheap I thought for a pair of sturdy heels, but truthfully what was I expecting from Primark? I find this outfit is useful for that awkward transition from Winter into Spring and even into Summer, as it keeps me sufficiently covered to protect me from any cold winds that may try to attack me on my travels but also exposes the arms, chest and feet letting them breathe and if they’re lucky, catch a bit of sunlight!